You might encounter problems when trying to delete text from PDF using programs like Adobe Acrobat, or some online tools that sometimes don’t properly display or arrange text. But not to worry. Here are 2 simple methods you can use to delete text from PDF easily while retaining the original formatting. The easiest way to delete text from a PDF on Mac (macOS Mojave included) is to use PDFelement ProPDFelement Pro. 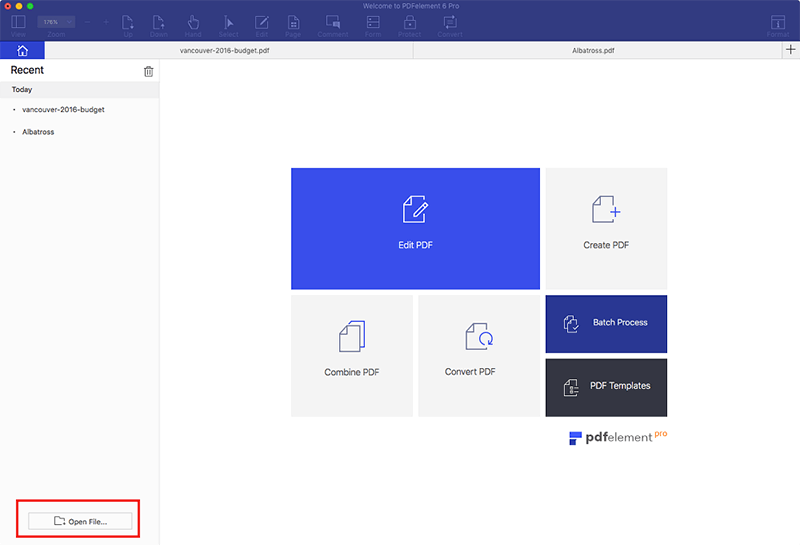 This PDF tool can help you modify your original PDF file to make it appear exactly as you want it. This program makes it easy to delete text, even if you are working with scanned PDF files. All you need to do is import your PDF file, and 2 Simple Ways on How to Delete Text from a PDF File on Mac (macOS 10.14 Mojave) and then you can delete or remove text from PDF files as easily as you would in a word processor. For Windows users, you can use PDFelement Pro for Windows to delete PDF text on Windows. Once you've installed this PDF editor on your Mac, you will need to open the PDF file you want to delete the text from. Just click "Open File" to select the PDF file. Or simply click into the primary window and drag and drop your files there. Begin by clicking the "Edit" button in the top toolbar and then select the text that you want to delete. Text is organized into text blocks and you can delete the text inside of the block or delete the entire block quickly and easily, depending on your needs. After you have deleted your desired text in PDF Mac, remember to save your work. This tool is great since it makes all PDFs in Mac completely editable, allowing you to make changes throughout the files as is you were using a word processor. PDFelement ProPDFelement Pro is a professional PDF editor which provides you with multiple PDF editing tools to edit PDF images, links, pages and other elements. The advanced OCR feature will enable you to convert and edit scanned PDF files with ease as well. Easily edit, add, insert, delete, highlight and underline PDF text. 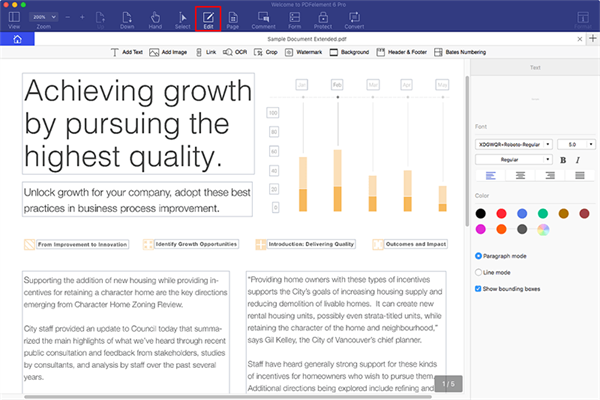 You can mark up and annotate PDFs with many handy tools. 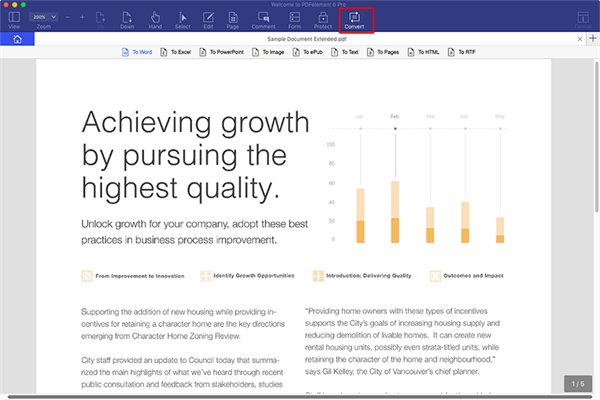 Fully control PDF pages by copying, rotating, deleting or inserting them. You can also convert PDF to Word and fill out PDF forms with ease. Delete text from scanned PDFs using the OCR feature. By converting PDF files to Word you can also delete PDF text. PDFelement ProPDFelement Pro is a very useful tool to convert PDF to Word, images, PPT, Excel, and other popular document formats. In just a few clicks you can convert files effortlessly. Using this PDF converter, you can easily convert your PDF to Word format and then delete the text as needed. Launch PDFelement Pro for Mac, and click the "Convert PDF" button to open the conversion window. You can then drag and drop PDF files into the pop-up window. Now select "To Word" as the output format. Select the page range you want to convert, then click "Convert" to start the conversion. After that, you can freely to delete any text you want. After you have deleted the text in PDF Mac, remember to save your work. This is such a simple and amazing tool. PDFs were once only readable but now, using tools like this, they are fully editable and just as easy to work with as a text document in a word processor. Office 2013 Doesn't Let You Edit and Convert PDF on Mac, See How?